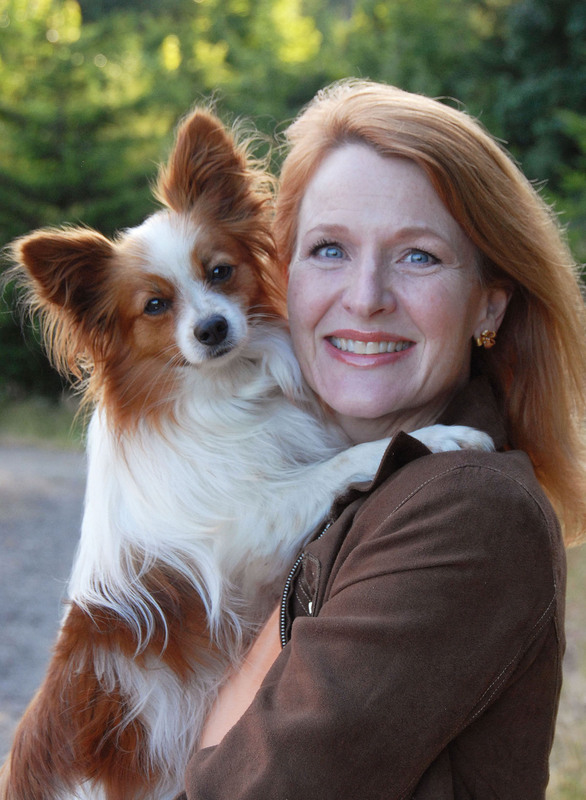 Shawna Schuh, President, Women In The Pet Industry Network & her dog Stewart. Everyone has a story to tell about how they got involved in the pet industry. What is yours? I had pets since the time I was young; we always had pets. And then industry, I went into entertainment and yet I always had my dogs, and we always had cats and we always had cattle. I married a cowboy interestingly enough, and my husband and I were out in the middle of nowhere and he worked with horses, so when we were first starting out we opened a retail store, called Saddles & Soles. That was my first foray into doing retail and being involved in the horse industry from there. From there, I decided I was going to focus more on business. So, I went to the business and got all my certificates and my education was all in business. But my husband continued to be a horseshoer and we had a boarding facility. So, I’m doing business, he was doing the horse shoeing, and we were both involved with animals the entire time. One day, I was with one of my business clients and I said to him “You know what, you’d be a better leader if you had a dog”. He responded “A dog? Are you kidding me?” and I said “Yes, but you can’t fire them and your inconsistencies would really show”. He said, “You know, you got a point there.” I found myself using more and more animal analogies and so I thought why don’t I work with people who already have animals and that I know. So, after being in the industry for such a long time with the store and the boarding business I started doing the research within the pet industry and I discovered that number 1, what a great industry and number 2, they need me because there are fascinating, innovative, amazing people are in the pet industry but they’re not always focused on the best communication, business strategy wise. And so, I started doing research and I came across Women in the Pet Industry, which was an association that wasn’t doing well. So, I joined and ultimately acquired it. That’s my story, and it’s crazy, but from the time I was a baby until now, I was with animals. For the last 5 years I was doing research, now I’m the President of Women in the Pet Industry Network, and I can’t tell you how happy and excited I am. Tell me about the Women in the Pet Industry network. Where to start, it’s just the most exciting thing and the reason it’s so exciting is because women want this so desperately and women want to connect. Women, from all ages, from way in the old days when people got together with their quilting and they would help each other. We are in a go, go, go type of society, and yet we need to connect more than ever before. Women in the Pet Industry Network is a network that is based on three philosophies. Number 1, we give first. One of our members said its generosity, generosity in what you know, generosity in your resources, generosity in your networks. And so, we always give. We get people who come to the network and say, “sell me on this” “what’s in it for me” and I usually have to go “you know, I don’t think there’s anything in it for you”, because it’s not about what’s in it for you, it’s what can you give. Anyone who is a giver knows, and the longer you’re alive you realize this, is when you give you get back tenfold. So now there are women who are stepping up and saying “I know how to help you” or “what can I do for you” and they are just benefitting through partnerships, everything. Our next philosophy is about growth. We do education sessions every month, we also have share calls, and we get together at meet-ups, so that you’re learning something. One of the things I say as an executive coach is “ask questions like how are you, what is it, what is your biggest secret, how do I help you, what makes you tick, what’s the best tip you learned from this conference or expo.” The last philosophy, so giving, growing and then connecting, and usually for mutual benefit. So wouldn’t it be easier, I’m out there by myself doing all this stuff, but you’ve got a complimentary product… how do we work together on this. Someone has this fabulous display but they don’t have everything for it, why not use another member’s bowls or why not use another members to decorate. And then when someone comes in and says they love it you can say it’s from the booth over there. It’s so fabulous, our network is all about helping each other. What is the profile of your membership? This is the other thing that I think is so different about us, there are all these other networks and associations out there. Such as the pet sitter’s association, the association of professional dog trainers, APPA, the veterinarians… everybody has their own associations and they sort of know each other, but in business you learn the most by looking and studying businesses that aren’t like you, it’s smart business. We are the only network in the pet industry that takes everybody, which is our strength. We not only do equine, canine, feline, avian, tropical fish, but we also have the groomers, the sitters, the products, the retailers, the counselors and PR people because when we sit across the table from each other you are going to learn more from somebody not in your own niche, even though the niche is pets it’s all cross category. And that’s what makes us so unique and powerful. Do you need to be a business owner to be apart of the network? You don’t have to be a business owner, but you need to be in business. We have many corporate people, who are the marketing directors, people who are running the corporations. You don’t have to own it, but you need to be in a position of influence. So, it’s women who are in powerful positions, marketing, and business owners, all of it. We are here at Global Pet Expo, what is the next activity or opportunity for someone to get involved in the organization? Well, one of the reasons we’re here is because we are doing meet-ups. American Pet Products Association is actually a member of Women in the Pet Industry and that is what is so beautiful because they have their own network of just people in pet products and there is a breakfast for just women on Friday morning and we’ll all be there in force. The best way to get involved is to join us; we’re very value-centric. We also do different things, we have a book where we promote each other, Top Women in the Pet Industry magazine so that’s another way to get involved. Becoming a member is the best way to become involved. You go online to www.womeninthepetindustry.com and sign up. Not only do we have a Facebook presence, which is good, but also our private page for Women in the Pet Industry members is so active. I talked to media experts, social media experts, and they cannot believe the engagement we have on our member page. Sometimes groups start and then they sort of fizzle out, constantly women are saying “hey, I read this great article about this and you need to know it” and they link to it for our members, or “hey, I’m going to be some place, who else is going?” or “my product is going international and I need someone who understands how to translate” and women go “I know, I’ll help you”. Our Facebook is very, very active. And of course, we’re on LinkedIn, Pintrest, Imgur and all of them. We also have a YouTube channel where we have a lot of videos that help members. If you had one goal for this network, what would it be? The biggest goal would be that we grow, because all of us are stronger than any one of us. Our strength is in numbers. Now when I first said that, we just wanted lots of numbers and now I’ve really revised that because as we’ve grown forward things are happening that are so intriguing where women will go “I don’t know if I got anything out of it”, and you won’t unless you put something in. In reality, we don’t need thousands and thousands of members; we need members that have the right philosophy. So, what is happening now is a woman will go “I want to know what you are about” and “I think I have value to add”. And when they have value to add, they already understand that they are going to get a ton out of being a member. Our members are now becoming these forces to be reckoned with, it excites me out how great our members are, how powerful they are, and what they do. And of course, those are the ones that give the most. If you think you’re a woman like that, join us.